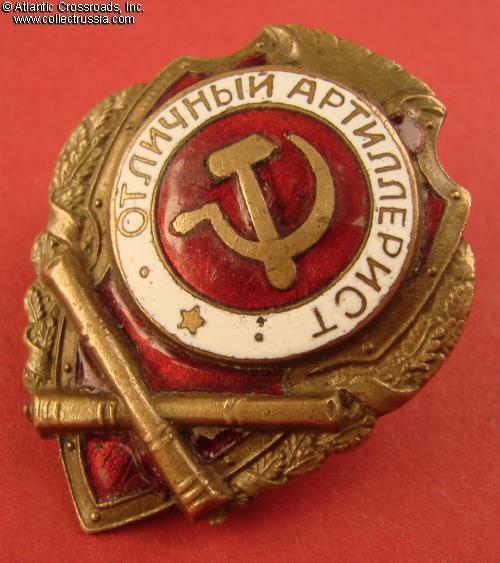 Excellent Artillery Man badge, mid 1940s. Brass, enamels; 44.4 mm x 35.8 mm. This very early variation features smooth top ornament with less defined scrolls than the later versions. 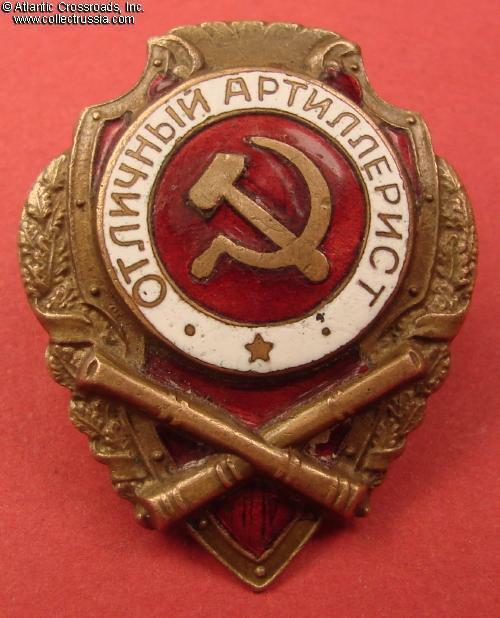 There is no ornamental pattern under the red enamel, making this version similar to the Type 1 with superimposed hammer & sickle. There are other similarities with the early type guaranteeing that it was apparently produced immediately after Type 1, most likely in 1943. 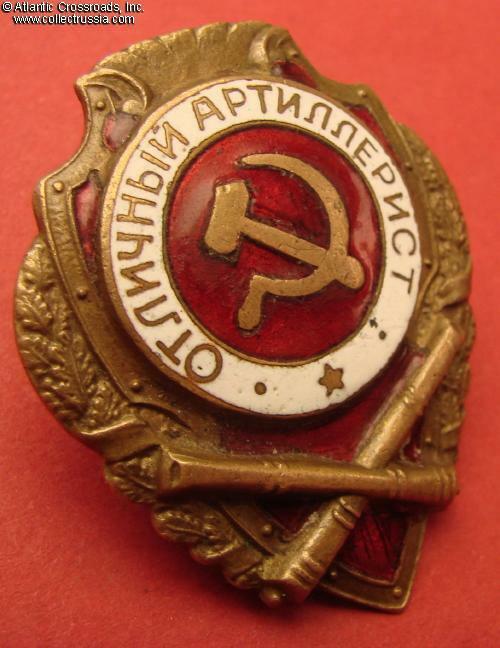 Consensus opinion among collectors is that this version of the badge is of Moscow's Pobeda Factory manufacture, although the Type 1 was produced by the Foto- Yuvelir Workshop (also in Moscow). 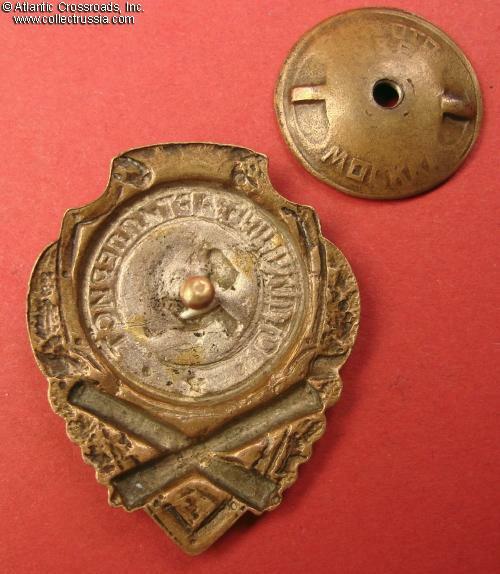 Note that the screw plate of this particular badge - undoubtedly original - is marked "Foto-Yuvelir". 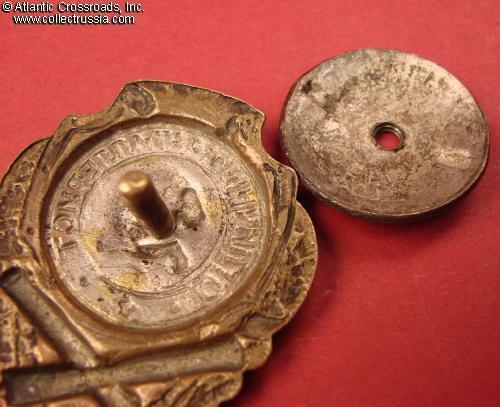 Judging by the similarities in their output, the two factories were probably closely affiliated and it is entirely possible that one could use a screw plate from another. In very fine to excellent condition, far better than the average for a combat proficiency award of WW2 period. The enamel shows light surface wear, scuffs and contact marks throughout, but no chips or significant flaking. The red enamel in lower portion has a couple of hairlines that are nearly unnoticeable. The details of the wreath and cannon are nicely preserved and crisp. A good amount of the original silver finish on the reverse is still present. The screw post is full length, approx. 14 mm. 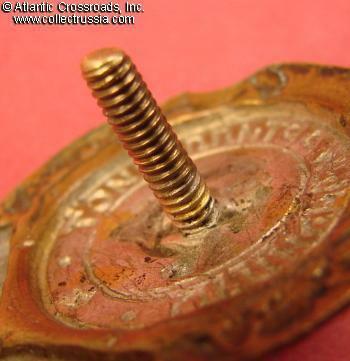 Comes with a scarce original screw plate marked "Foto-Yuvelir, Moscow" (this screw plate strikingly resembles the early 24 mm version of the Pobeda screw plate).